Indian Navy Tradesman Admit Card 2019 – Indian Navy has released the Indian Navy Tradesman 2019 Examination center list. Indian Navy Tradesman Admit Card released on April 02, 2019. The admit card for the written examination has been made available at the official website i.e. joinindiannavy.gov.in. For fetching the Indian Navy Tradesman Admit Card 2019 candidates have to mention Registration Number and Password / Date of Birth on the login page. Up to April 14, 2019 candidates can download their Indian Navy Tradesman Admit Card 2019. The Indian Navy Tradesman 2019 written examination will be conducted as per the date mentioned on the admit card. 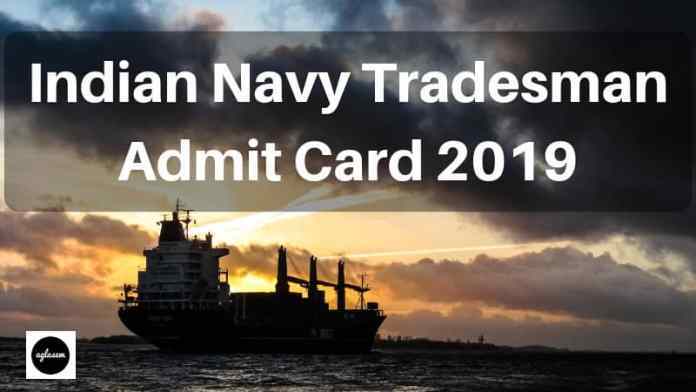 Check entire details regarding Indian Navy Tradesman Admit Card 2019 from this page. The examination center list has been released. Scroll down to check the same. Indian Navy has issued the admit card for Indian Navy Tradesman Recruitment 2019. Scroll down to check the same. The candidate’s who have submitted the application form om time for those only Indian Navy Tradesman Admit Card has been issued. The candidates can only use online mode for fetching the admit card. The call letter / admit card will not be sent by mail or post. For more information regarding Indian Navy Tradesman Admit Card 2019 check the schedule given below. Download Admit Card: Click Here for downloading the Indian Navy Tradesman Admit Card 2019 will be available. Examination Center List: Click here for checking the Indian Navy Tradesman examination center list. After downloading the admit card candidates should take the print out of it for future reference. Follow the steps given below for downloading the Indian Navy Tradesman Admit Card. In the admit card login page enter Registration Number and Password / Date of Birth. After entering the login details click on the Login button. Thereafter, the admit card will display on the screen. Click on the download option for downloading the call letter. From below check the details which are mentioned on the Indian Navy Tradesman Admit Card 2019. The details mentioned on the admit card should match from the details entered in the application form while doing the registration. After downloading the admit card candidates should properly read the details mentioned it. If in case admit card is carrying any incorrect or false details then immediately contact at below mentioned contact details. If candidates are having any query regarding the Indian Navy Tradesman Admit Card 2019 then also to he / she can contact at the below provided details. What to Carry On Indian Navy Tradesman 2019 Exam Day? It will be mandatory for all the candidates to carry the below mentioned documents on the day of the examination. If candidates will not carry the below-mentioned documents on the day of the examination those will be not allowed to appear for the examination. Before starting the preparation candidates have to first read the exam pattern because this helps the applicants knowing about the examination. From the exam pattern candidates git to known about exam mode, marks, subjects, standards of question, etc. Check the detailed Exam Pattern Of Indian Navy Tradesman Examination 2019 from below. From below candidates can check the detailed syllabus of Indian Navy Tradesman Written Examination 2019. The questions standard will be of Matriculation and ITI level. i.) General Intelligence and Reasoning – Questions related to Mathematical operations, Series, Odd One Out, Logical Venn Diagrams, Analogy, Word-Based Problems, Problems Solving, Drawing Inference, Coding-decoding, Non-Verbal Reasoning, etc topis will be asked. ii.) Quantitative Ability – This paper will include questions related to Number Systems, Time & Work, Mensuration, Ratio and Proportion, Average, Profit and Loss, Discount, Percentage, Time and Distance, Simple and Compound Interest, statistical Chart, Trigonometry, Geometry, etc topics. synonymous, antonyms, Comprehension and its correct usage, etc will be asked. neighboring countries especially pertaining to sports, history, culture, Geography, Physics, Chemistry, Computer Science, Environmental Science, Economics, Current Events, General policy including Indian Constitution and scientific research, etc.